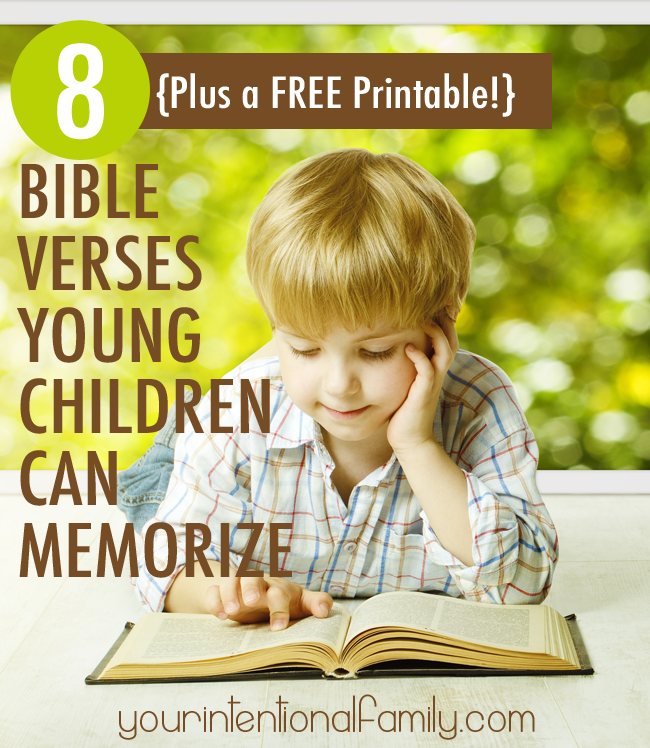 Children memorize scripture far more easily than adults! Or at least in our house this has proven to be true time and time again. It blows my mind how quickly my son, who is currently five years old, can memorize whole passages of scripture when I’m still struggling to get the first few lines nailed down. We’ve been doing family devotions together in the morning around the breakfast table for a little over three years now. Scripture memory has always been a part of our time together, and since implementing this method of scripture memory we’ve been memorizing more scripture than ever before. This week we released a podcast that talked about our journey into family devotions. 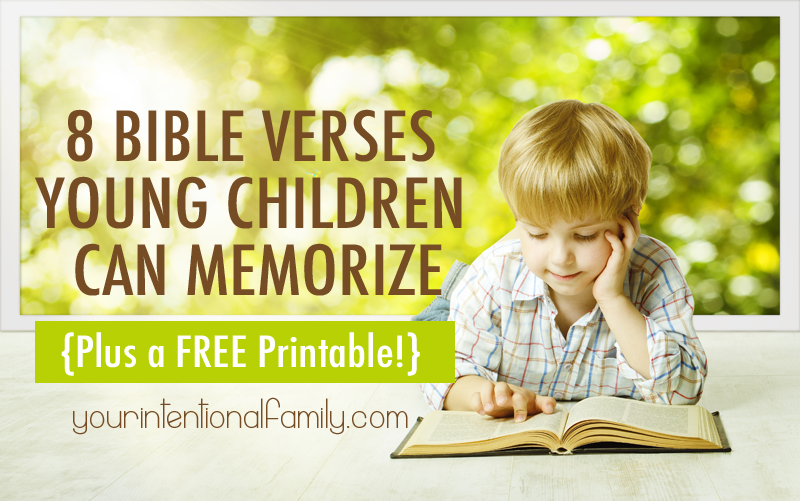 In this episode I mentioned some great verses for young children to get started memorizing. I also promised a printable to take with you! So, this post is me making good on that promise! During the early years of learning, children love memory work, and they are quite good at it. Their little minds are like sponges! Here are eight verses we’ve found to be a great launching pad into further scripture memorization with our boys. Genesis 1:1: In the beginning, God created the heavens and the earth. We chose Genesis 1:1 as our son’s first Bible verse to memorize. Creation reveals its Creator, which make it important to know. Unless we believe God created us, the rest will make zero sense. Creation pales in comparison to the person and work of Jesus Christ! God created us and He loves us. John 3:16 is a truth-packed verse that is easy for little ones to memorize. They should know from a young age that God loves them so much that He sent His Son to die on the Cross for them. Ephesians 6:1: Children obey your parents in the Lord for this is right. During the early years of life, it’s important to understand that God has given Mommy and Daddy authority over their little ones. Ephesians 6:1 is often quoted throughout the day as a reminder that it is God who wants children to obey for it is right. Psalm 66:1: Shout for joy to God, all the earth! This verse is just a lot of fun for young children. Serving the Lord is filled with joy and we should shout it from the rooftops. Letting children shout and jump and proclaim Jesus is just fun! Matthew 22:37-39: And he said to him, “You shall love the Lord your God with all your heart and with all your soul and with all your mind. This is the great and first commandment. And a second is like it: You shall love your neighbor as yourself. We memorize these verses to help us understand loving God and loving others. It comes in particularly handy with small children when working through the concept of sharing with others! It is important to us that our children understand early on that loving others is an important part of being a Christian. Matthew 28:19-20: Go therefore and make disciples of all the nations, baptizing them in the name of the Father and of the Son and of the Holy Spirit, teaching them to observe all that I have commanded you. And behold, I am with you always, to the end of the age. We want our children to understand that we are called to live out our faith and share it with others. These words of Jesus are an essential part of the message we want our children to take hold of. Romans 10:9: Because, if you confess with your mouth that Jesus is Lord and believe in your heart that God raised him from the dead, you will be saved. What a sweet place this verse has in my heart because it’s the verse that made the gospel real to our oldest. This is a great verse to memorize the basic truth of the good news! Often throughout the day, children require correction for wrong behavior. As parents, it’s easy to correct the behavior without telling them what God’s way looks like. We had our son memorize the fruit of the Spirit in order to help him know not only what he should put off, but what he should put on instead. I even built a curriculum around this verse to help instill this concept further. These are the first verses we have our children memorize. There are, of course, many more verses you can choose! And even more that you might find more important for your family. But hopefully these help you get started! 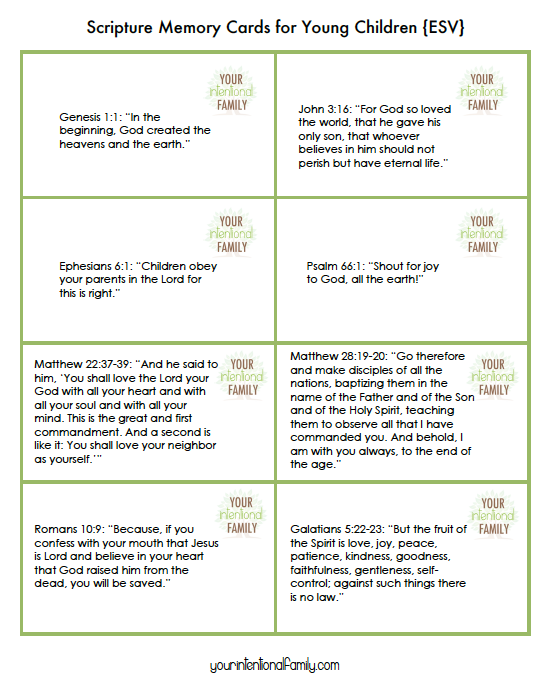 If you’re interested in a FREE printable, you can download these verses in the English Standard Version here: Scripture Memory Cards for Young Children. Don’t forget to check out our scripture memory system that has helped transform our ability to memorize scripture. It’s a little bit of work on the front end, but it is absolutely worth it! You can also listen to the podcast that inspired this post here: Our Journey into Family Devotions. 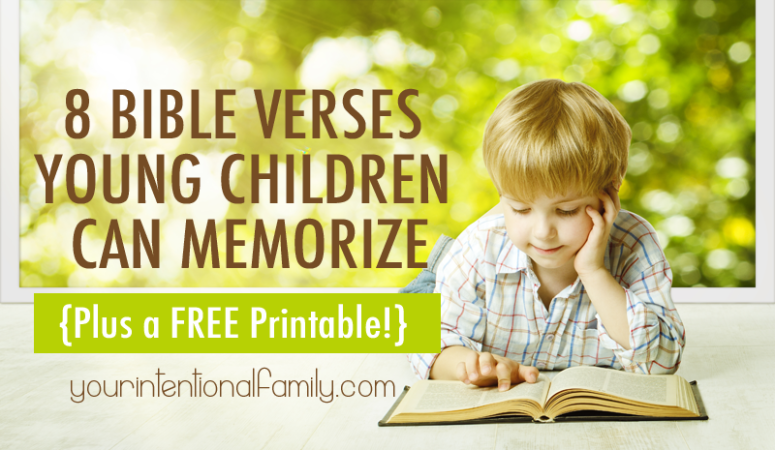 Tell me in the comments what verses you have your small children memorize! Want to share the Gospel with your toddler or preschooler on a more regular basis? 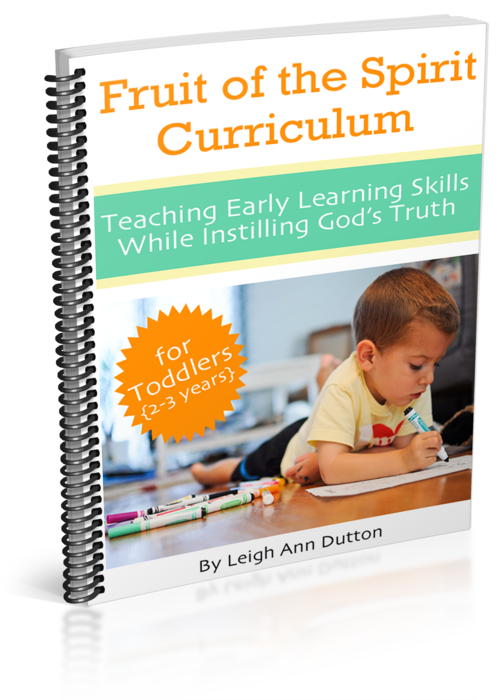 Want to start teaching biblical truths to your child but not sure where to start?